Information: This book covered phases of some of Tatsunoko's most popular action series. These included equal-sized entries; Hurricane Polymer, Casshan, Tekkaman and Gatchaman. The Gatchaman section has ten color pages with the opening film and story diegests for episodes 1 "Gatchaman Vs. Turtleking", 53 "Farewell Red Impulse", 105 "Earth Vanishes! 0002". It has two pages on main characters and two on mechanics. Also, there is one color page mentioning Gatchaman II and Fighter. 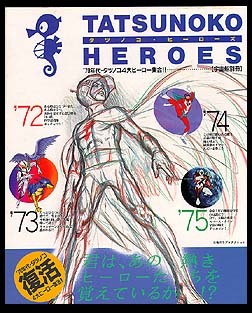 There was an 8 page black and white section with a smaller version of the planning for Gatchaman, illustrated with model sheet drawings of characters and mecha. There was a two page commentary section as well. There were interviews with Katsuji Mori (Ken's voice), a small section on the Time Bokan video and a mention of the OAVs. There was a small section on goods, including models, toys, video and books. In the back, there was a complete episode title list.